Studio 5380: Easter Peeps and a Give-Away! * My Bag Toppers were created with Spellbinders "Grand Labels Eleven"
I have noticed over the last few days that my blog has gained quite a few new friends after the Peachy Keen / KaDoodle Bug Designs Blog Hop! To those of you who are "new"...Welcome! I hope you will continue to pop in for a visit when you get a chance. And, to my "old friends"....you guys are the best! I always enjoy your visits and the wonderfully encouraging comments you leave for me! So - I thought I would put together a little spring time give-away to say thank you! That's it! I will randomly choose a winner on Friday, March 15th. Thanks so much for stopping by and I'll be seeing you soon! What cute little toppers. Love the embossing and soft colors. Thanks for such a awesome giveaway. You rock. What a sweet gift/treat idea! sooo cute and yummy!! great giveaway also!!! love stopping by to see what great project you have up!!! These are adorable! Your grandkids are going to love them:)Thanks for the inspiration! Such adorable treat Tanya!!! Those kiddos are going to LOVE them!!!! 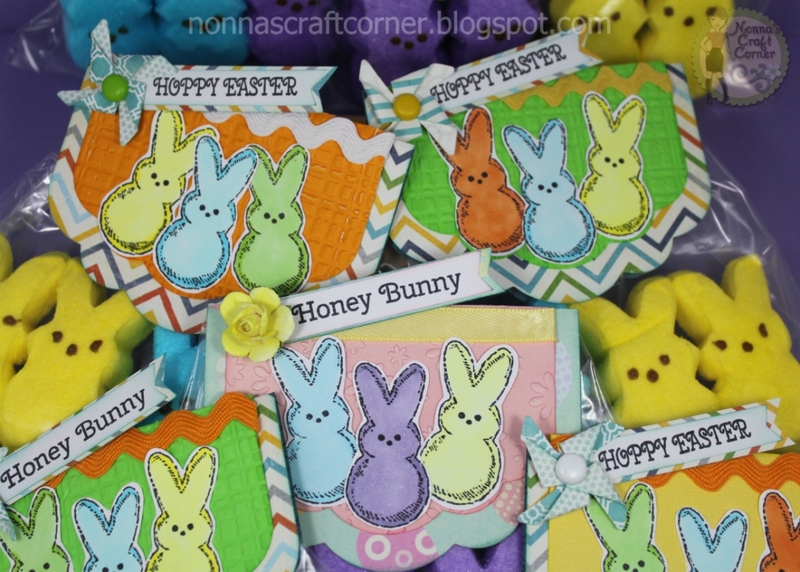 GREAT colors and cute peep stamps!! Oh my goodness...look at this yummy treat! 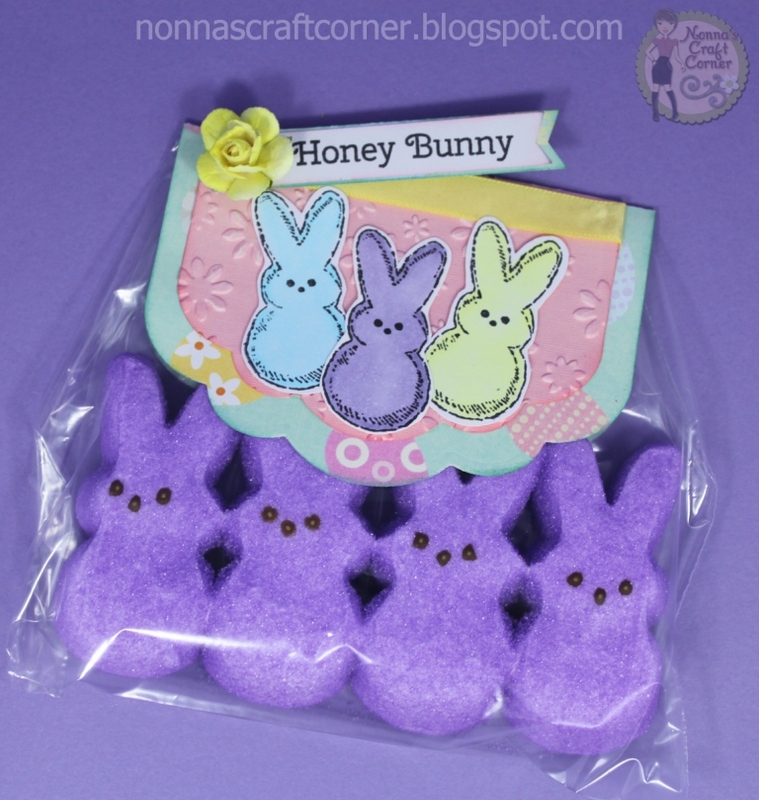 Your little bunnies are super adorable and those peeps....delish! So cute Tanya!! Congrats on more followers!!! Doesn't surprise me, your creations are amazing! Thanks so much for a chance at your giveaway:) Hoe generous of you! You will be making someone's day! 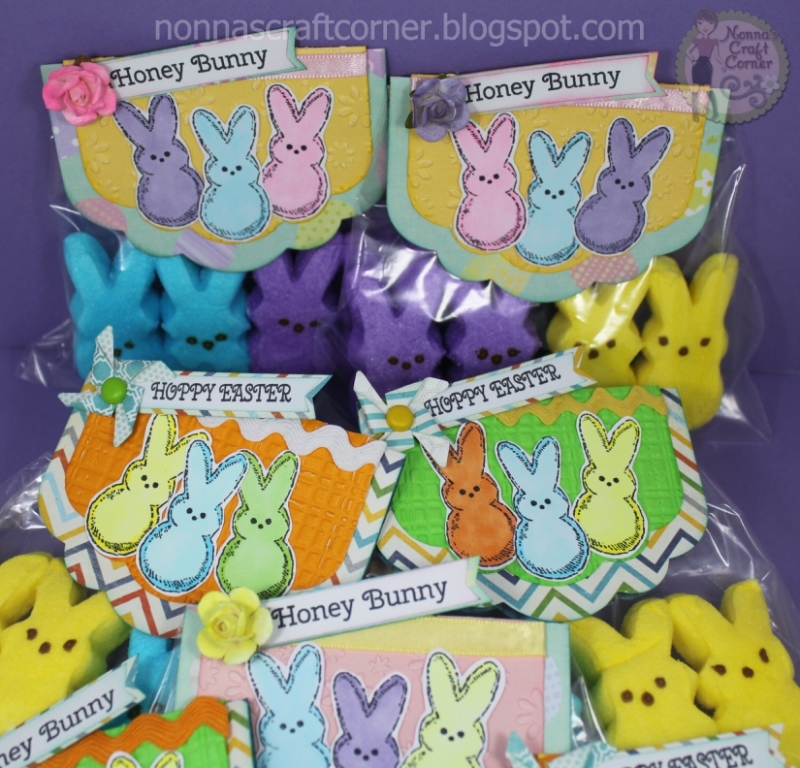 Fabulous Peep Treat Toppers!! Love the little bunnies and the coloring is fabulous!!! Love your treat bags and toppers. The bunnies are gorgeous... And the pinwheels! These are so adorable !! The best way to eat peeps are leave them open on the counter for about a week and let them get crunchy :) I am so happy for you and getting a bunch of new followers you are an amazing and talented lady !! Hope you are having an awesome day my sweet friend . 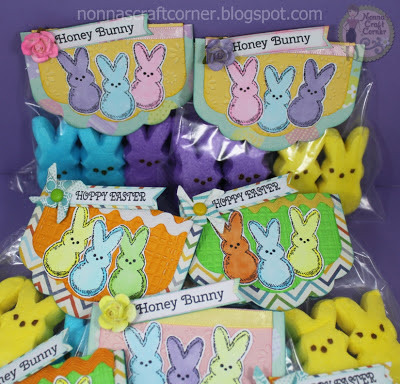 The peeps are adorable ... really cute treat bags for the kids! Love the pinwheels, too! Super Duper Cute and Yummy Treats! !I am so happy that you hev new followers!They will love you!I do! !Your projects are AMAZING!! Oh My Gosh Tanya! These are SO cute! That is one of my favorite stamp sets of all time and I totally forgot that I have that one! I have to get busy. I haven't made a single Easter card this year. I need to go buy some peeps now! Thanks for the reminder! Hopefully I will have some cute versions to share soon! I just love these treat toppers!! I especiallly like the mix of patterned papers and embossing! Cute! Thanks for a chance at a givaway! Love your cute cute Peppe treats! Gunny how peeps come in so many colors now days. Great day. Adorable! The kiddos are gonna love these! Oh how I wish I loved the taste of peeps they are so darn cute but I think they taste nasty! Super cute treats, those will be gobbled up in no time! I love all of the fun details you added! Super cute toppers. The grands will love them. Already a follower. Thanks for the chance to win. I just love your projects and ideas. I always look forward to your emails to see what new fun project you have created!! that is so sweet of you! I love seeing all of your awesome projects!!! I am a long time follower. Thanks for the chance to win the giveaway. The treat bags are so sweet. Awesome Treats, I want to eat some of my peeps now, lol. Oh my, your little Honey Bunny Peep treats are adorable!!! Thanks so much for the chance to win, too.. These are so cute! I was thinking of doing something for my daughter's teachers and you may have given me the inspiration I needed! Thanks! These are so cute. I love Peeps cuts. Super cute treat toppers. Love the colors! Such a sweet treat for your Grandkids. I love the colors, so bright and cheery!! I love reading your posts. You have such neat ideas like the toppers for the treat bags. You also inspire me to use my embossing folders more. I would love to win your giveaway. Those stamps are so adorable and I would have lots of fun playing with them. I don't really have a lot of pattern papers either so have to use digital ones and theses are so yummy. Thanks for the chance to win. Your goodie bags are adorable. WHo doesn't like PEEPS! Love the treat bag toppers, the little rabbits are adorable. The treats look yummy too:-) Have a great week. Very cute Tanya, I am sure the grands will love them!! Super cute treats! You did a beautiful job with it! Thank you so much for the opportunity to win! Too totally bunny cute!!! Love them toots!!! Am a follower. Thanks for a chnce at some sweet candy. Tanya ~ Alright these are so CUTE and CLEVER! Your bunnies are colored PERFECTLY!! I your grandchildren will LOVE these! What a fun idea for my son's class too! might have to borrow this idea ~ Thanks! So happy you had a "relaxing" weekend!! Have a great evening! It looks like you had a VERY productive weekend. Super cute, I hope your grandkids love these! The candy is making me want some! These are just too cute! great idea, coloring and love the color palette!! super fun! Your grand babies will be thrilled!